Dunn's Arum is an arum with a peculiar flower stalk that reaches 2 ft tall, topped with a 8-10 in ice cream cone-like flower. The spathe looks like a green-and-white speckled cone. 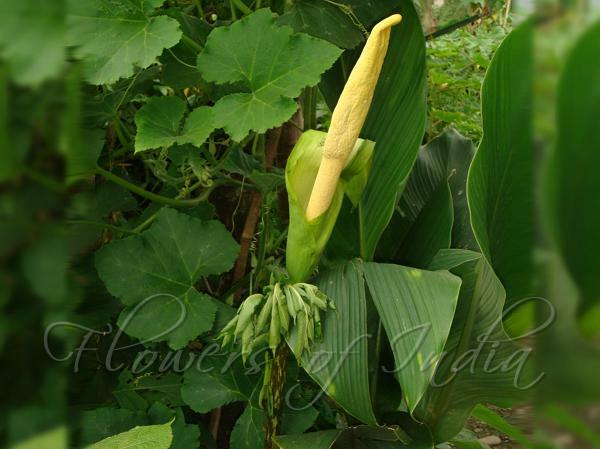 The creamy white spadix, the appendage carrying the actual flowers, its inside the spathe. The 2 ft tall speckled stalk is topped in summer with typical Arum foliage. This fast-offsetting species is easy to grow. 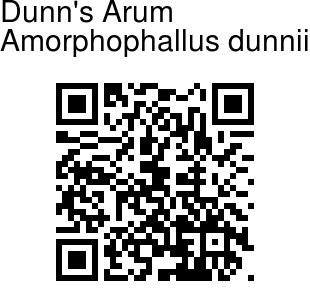 Dunn's Arum is native to China, Thailand and N. Vietnam. It is cultivated in NE India.